According to a majority of the reviewers, the Nike Air Force 1 Ultra Flyknit Mid is a shoe that provides great comfort for the foot. This sneaker provides good traction, according to some of the reviewers. Most of the reviewers said that this model is durable. Some of the buyers were glad that the shoe doesn’t easily crease. A lot of the reviewers claimed that the shoe is really lightweight. Most of the purchasers really loved the breathability of the sneaker. There are a few of the buyers that pointed out that the shoe breaks in easily. Some of the reviewers expressed how they loved the colorways of the shoe. A good number of reviewers said that this iteration has good ankle support. Some of the buyers were highly-appreciative of the style of the Nike AF1 Ultra Flyknit Mid. A variety of colorways that would suit one’s taste is available to choose from. A lot of the reviewers said that they would definitely recommend the shoe. Some of the reviewers claimed that the Nike Air Force 1 Ultra Flyknit Mid can be a bit narrow. More than a handful found the price to be a little too stiff. The Nike Air Force 1 Ultra Flyknit Mid being a new iteration of the iconic basketball shoe, the Air Force 1, is said to be the lightest Air Force 1. With the Flyknit technology added to the silhouette, a rather light and breathable feeling is provided for the foot. As with its origins, the shoe provides comfort for the wearer but only it runs a bit narrow for some. The first Air Force 1 was released back in 1982 and it became one of Nike’s iconic shoes. Since its first release, the silhouette has encountered multiple iterations already. By 2016, the Nike brand made a new iteration to the Air Force 1 profile. The idea of bringing the iconic shoe into a futuristic image without ruining its legacy, made the Nike brand to combine the high top Air Force 1 silhouette with its lightweight and breathable Flyknit technology, thus, the creation of the Nike Air Force 1 Ultra Fyknit. The whole process of creating the shoe all began when the designers of the Nike Sportswear went to Paris in summer and did some hot strolls around the city for 12 hours to seek inspirations. They came up with the idea of making a lot lighter and a more flexible shoe as well as improving the fitness and decreasing the creasing tendency on the toe vamp of the shoe. Jonathan Johnsongriffin, Nike Footwear Design Director, manually joined a Flyknit upper in dark grey with an Air Force 1 sole, 3D-printed prototype. With a black marker he added the Nike Swoosh along with the eye soles. The design Johnsongriffin made was favored, since it retained the legacy of the original Air Force 1 silhouette. The comfort of the Nike Roshe One was also added to the new design. The whole design team for the Nike Air Force 1 Ultra Flyknit went on creating a sample of the shoe and used the Flyknit material in multicolor. With a team composed of footwear engineers, 3D designers, developers, Flyknit programmers, last engineers, and product line managers, the development of the shoe was officially on the road. The whole team worked together to bring the shoe into life and also to be able to maintain the essence of the Air Force 1. The team successfully produced a very lightweight shoe and micro-engineered the details on the stitching of the upper of the shoe providing great comfort and super light feeling. Two Nike Air Force 1 Ultra Flyknit shoes were first produced. One was in a University Red colorway which belonged to the Nike Sportswear while the other was the classic Air Force 1 all-white colorway which belonged to NikeLab. Having its roots coming from an iconic basketball shoe, the Nike Air Force 1 Ultra Flyknit Mid does not limits its style capabilities as to just being an athletic shoe. With its stylish design and fresh and colourful colorways, the shoe has proven its versatility and functions as a fashion shoe as well. The shoe can be a good choice as a complement for a street-style outfit when going out with some friends or a casual attire when running errands. It can go well with a pair of skinny jeans or a pair of joggers or jogger jeans. The Nike brand enhanced the fitting of the Nike Air Force 1 Ultra Fyknit Mid from its origins. Those with slightly wider feet may find it just a tad narrower than usual. Nike offers 8 to 13 for the men’s sizes and 4 to 11 for the women’s. The shoe also fairly runs true to size. 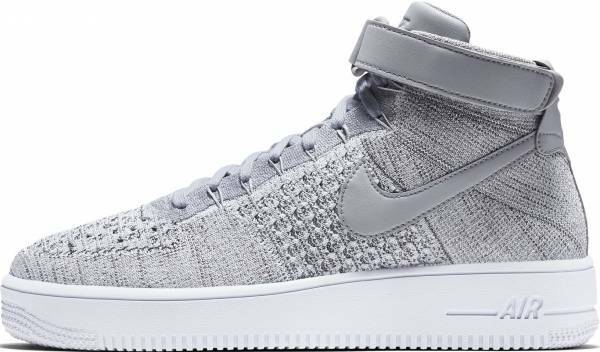 Being a lightweight shoe is what most of the buyers love about the Nike Air Force 1 Ultra Flyknit Mid. They love how light the shoe feels when wearing them and also how comfortable it is on the foot. The stylish look of the shoe also catches the eyes of most buyers. They loved how the shoe looks and how “cool” the colorways of the shoe are. The traditional Nike Swoosh logo is in leather and can be seen on both sides of the shoe. A leather heel tab is observed. The shoe is provided with a Flywire lacing system. The shoe is provided with foam collar. The shoe is sold at a discounted price in some retailers.